Receiving Line at Church or Not? 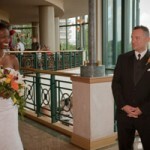 Whether you do a receiving line after your Ceremony at church depends on how much time you have. 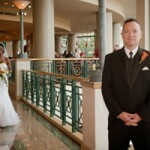 If you have 200 or more guests, a receiving line can take more than half an hour. 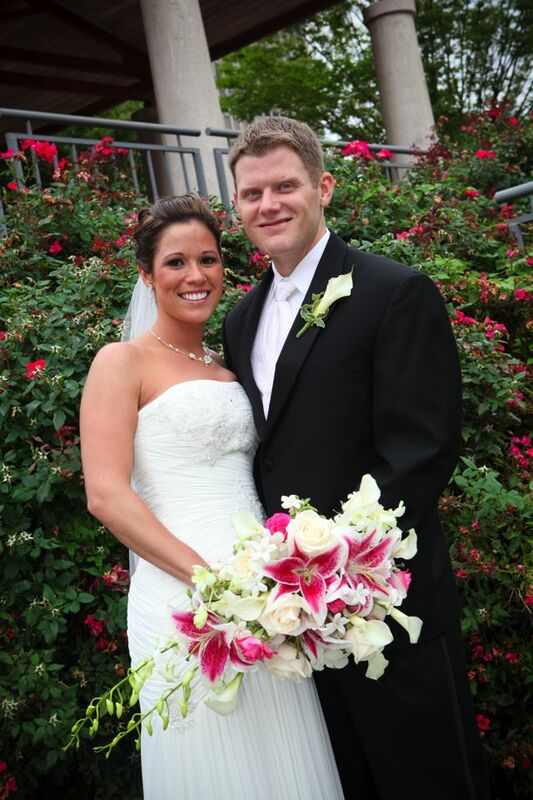 There are a number of ways to greet guests after the ceremony at church. Som e couples choose to do a “release by pew” at the church. They go down the aisle in the recessional, then come back up and start with the family pew, acknowledging each person for about ONLY 3 seconds, then move across the aisle, then to the next pew. So, except for people who don’t come to the church but only go to the reception, they have “talked to” each person. With 200 guests, that should take about 20 minutes, but you really need to keep moving. A traditional receiving line at church is another option. Just stand near the door or outside and quickly greet each guest on their way out of church. With 200 guests, it’s probably 20 plus minutes. It moves quicker if it’s just the parents and bride and groom and not the whole wedding party. The key is to keep it brief and move people along. 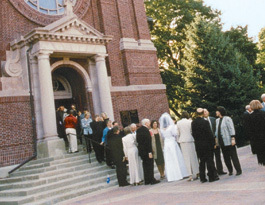 Some couples who don’t have time for a receiving line at church choose to show up at the reception about 15 minutes into the cocktail hour without an introduction and work the room to get a lot of the greeting out of the way. Then when the guests are asked to sit for dinner, the wedding party is lined up outside and the wedding party is announced into the reception. Even though everyone has already seen and talked with the bride and groom, the big announce into the reception still works. Then, if there’s still anyone they haven’t talked with, they will have time when they finish dinner (and their cake). Since the head table is served first, the bride and groom are usually up and going to tables of guests they haven’t spoken to yet while guests are finishing dinner. That gets it out of the way before the dancing starts. What you really want to avoid is still greeting guests once the dancing starts, keeping you from the party. And, naturally throughout the night, any guests who want to personally speak to the bride and groom and haven’t will come to them. Plan on talking to as many guests as possible … even if it’s just in passing, a nod, eye contact. For their September St. Louis Wedding, Jamie & Brian chose the Hilton Ballpark Hotel for both their Ceremony and Reception, as well as their base hotel for their many out-of-town guests. The large group of college friends and family made for a very festive celebration throughout the Labor Day Weekend. 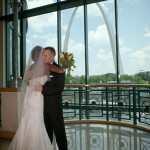 The Catholic Ceremony was held in the Arch View Foyer with scenic views of the Old Court House and Kiener Plaza. Cocktails were held in the adjacent Grand Foyer. Guests were invited to sign a stone with a message for the Bride and Groom to cherish for years to come. Pomegranate Martinis were the specialty drink during the cocktail hour. Custom imprinted fresh pink rose petals with the Bride and Groom’s names and date adorned the candlelight centerpieces. Once in the beautiful Arch View Ballroom, guests marveled at the gorgeous night views of the Old Court House, the Arch, and Keiner Plaza. Everyone enjoyed a champagne toast in their commemorative champagne flute favors. And, everyone danced the night away. Photos by Maggie Stolzberg at maggiestolzberg.com. Wedding Planning by Weddings By Renee www.stlweddingsbyrenee.com. 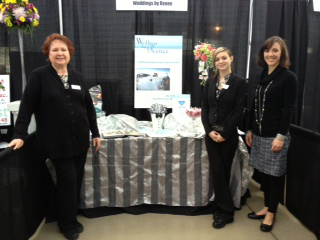 Here I am (on the left) with my team Kaytlyn and Ann at our booth at another fantastic Wedding Show on February 24 at The Foundry Arts Centre in St. Charles, MO. Sponsored by Perfect Wedding Guide, the show included wonderful wedding vendors from all over the St. Louis metro area. Everyone from River City Catering, Buse’s Flower & Gift Shop, Simply Elegant Bridal, Patrick Pope Photography, Old Hickory Golf Club and more shared great ideas and resources with area brides. See more of the vendors and photos from the show on our facebook page at http://www.facebook.com/WeddingsByReneeSTL. Like our page and send it on to your friends to like. 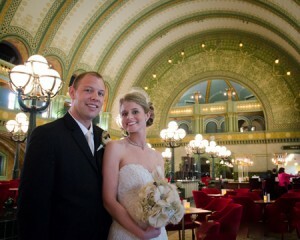 Wonderful Wedding Show sponsored by St. Louis Bride Magazine at the Chase Park Plaza Hotel on Sunday, January 13. 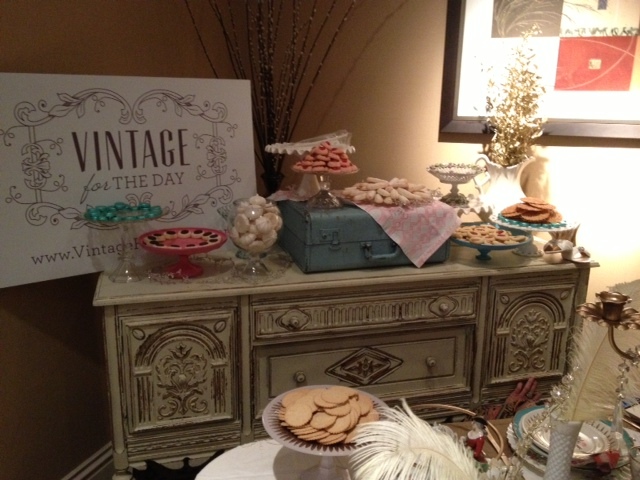 Lots of fantastic St. Louis wedding vendors like our friends at Vintage for The Day … Vintage decor rental. Excited brides, bridesmaids and mothers-of-the-brides getting creative ideas and meeting some of St. Louis best wedding vendors. 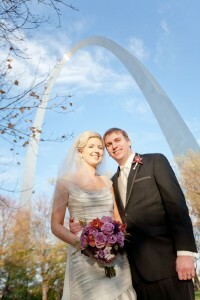 Thanks to St. Louis Bride Magazine! See photos about the show and of some of our fellow vendors on our facebook page on January 28, 2013. http://www.facebook.com/WeddingsByReneeSTL Be sure to like our facebook page and share it with your friends.